A customer asked me a question about Mirabelle's construction. To make sure I gave her the right answer, I decided to tat it as I hadn't made one for a long time. I don't think I'd ever made it with two colours before. I just picked up two shuttles that happened to have those colours left over on them and tatted away. 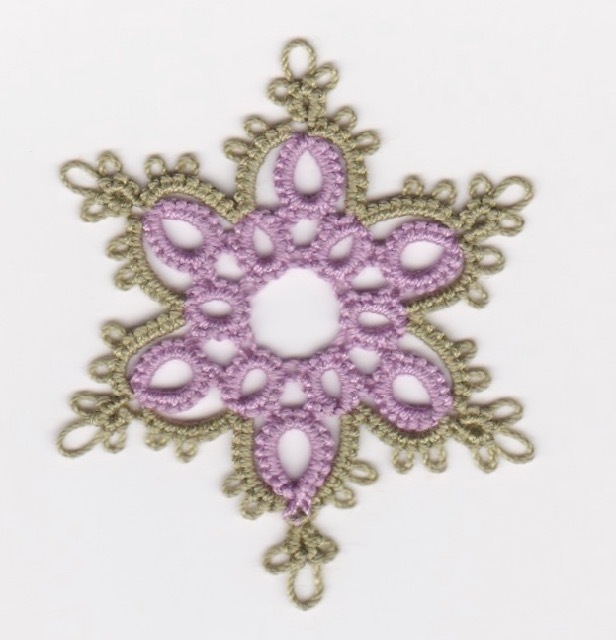 I'm afraid that's the only bit of tatting I have to show for this blogpost. I've not made much more progress on the green doily yet. But that's because I'm still enjoying knitting socks! 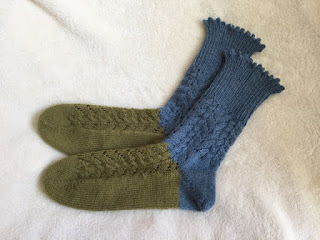 I made this two-tone pair with the left-over green wool from the pair I made for my friend's birthday. When I ran out of green, I just carried on with other left-over sock wool I had. 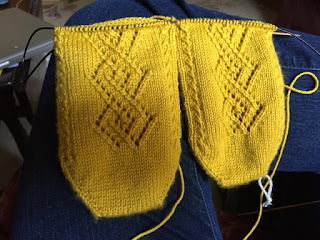 This is "Herringbone Lace Socks" by Leslie Verts again but I changed the open lace work panel for a small cable instead. I also knitted these from the toe-up instead of from cuff down as per the pattern. I wanted to try a picot cast-off. I did try it but did not like it! So instead, I used a crochet to cast-off. And I found that works very well. Looks really pretty, is very stretchy, and is easy to do. Winner. 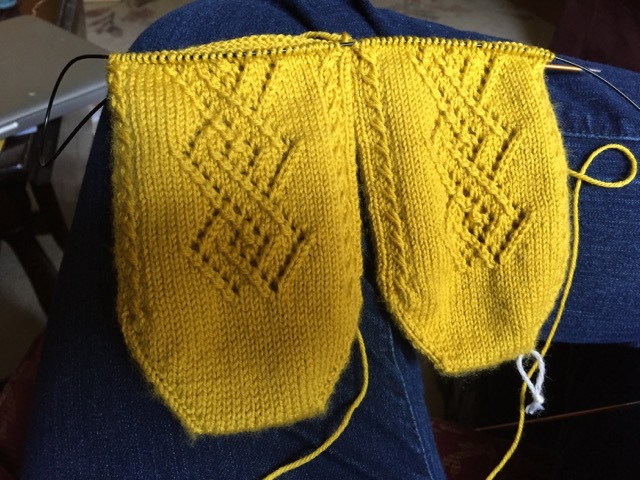 I then decided I really need to make a pair for my sister next. Her favourite colour is mustard yellow. 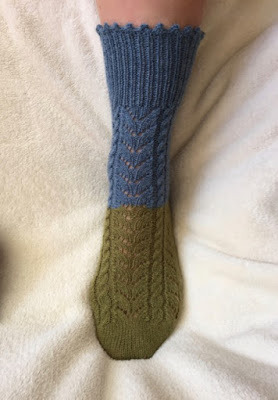 This pattern is by Wendy Johnson from her book "Socks from the Toe Up". I really like the lace work on these. Really pretty. 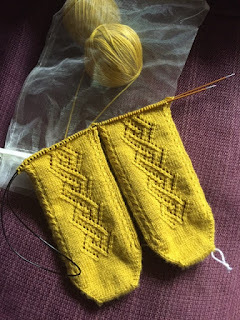 And I've fallen in love with a new sock wool I tried: Heritage Cascade Yarns Sock Yarn (because it was the only sock wool I could find that came in mustard yellow!). It is so soft and lovely to work with. I'm going to have to try it in another colour next. It comes in a 100g skein which I rolled into two balls so I could knit both socks at once (definitely my favourite way). On another note, I'm debating whether to move my shop from Etsy. I would be sad to leave and I'm not sure yet where I'd be going but I'm not happy with the changes they are implementing. It feels like a big upheaval to move and I still don't know what to do. I'm looking into alternatives/solutions but need to make a decision pretty soon. I'll keep you updated of changes. Thank you so much to all of you who have supported me there over the last seven years. 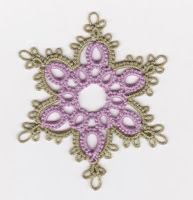 Love the tatting colors again but wow on the socks they are very perfect and love the top edge too really nice knitting! Good work, tatting and socks. OK, crochet bind off, I'll have to research that. Hi Jane, I'm sure you'll find tutorials on this but I made it up. I was trying the knitted picot bind-off and not enjoying it and then I thought picots are easy to make with a crochet, why don't I crochet the whole thing off! So I used a matching crochet size and just crocheted each stitch off the needle with some picots every 3 stitches (3 chain stitches, join back in first). I'll try it again on those yellow socks I think. I like Mirabelle in two colors! Your tatting is perfect as always. I am so jealous! No matter how careful I am, I just can't seem to achieve nice even double stitches. Oh, well... I'm still having fun! I love the blue and green socks! I'm not sure I'd have thought of that. I probably would have given up and started a new pair. I'll have to check out the Cascade yarn. I've only used their worsted weight for felted purses, and that's been a while! The Cascade yarn is lovely to knit but I'll reserve final judgement after it's been worn and washed. That'll be the real test of how good this yarn is for socks. But it's sure nice to knit with! I have closed my little shop on Esty totally fed up with them and the way they are demanding things and wanting to change things. I have gone to Facebook, but I am wondering if I have done the right thing or if there was something better without all the hassle of esty. That mustard yellow is gorgeous! Love the socks, love your cast off too. Oh no, etsy! I'll have to look at these changes for my daughter. Be sure to let us know where you go!